NEW YORK, Sept. 21, 2017 /PRNewswire/ -- It has been revealed that, within the last few weeks, "Pretty Paper" has been recorded as a last-minute addition for A Love So Beautiful: Roy Orbison With the Royal Philharmonic Orchestra. The album's release had been previously announced before the session that yielded the addition of "Pretty Paper." Utilizing Roy's original 1963 vocal track, the Royal Philharmonic laid down instrumentation for the holiday standard written by Willie Nelson. It joins 15 other Orbison classics tracks that comprise the album. Due out November 3, A Love So Beautiful is to be released through Sony Music's Legacy Recordings in partnership with Roy's Boys LLC, the Nashville-based company founded by the late icon's sons to administer their father's catalog and safeguard his legacy. Available on CD, vinyl LP and digital formats, this brand-new album infuses Orbison's best original vocal performances, consisting of hits and fan favorites such as "Oh, Pretty Woman," "Crying" and "Only the Lonely," with the emotion and world class musicianship of the Royal Philharmonic, London's most notable orchestra. Roy's sons Wesley (guitar), Roy Jr. (guitar) and Alex (drums) provided instrumental backing on selected tracks, along with ten-month-old grandson Roy III (guitar, tambourine). When made aware of the new recording of his "Pretty Paper," Willie Nelson commented, "Back in 1963, right after I wrote it, I brought the song to Fred Foster the head of Monument Records, the label I was with at the time. He really liked it and said 'It's perfect for Roy Orbison.' I was more than ok with that idea since I had wanted my tunes to be covered by big stars and Roy was certainly that. Fred told me he was going to play the song over the phone for Roy who was in London at the time and that's exactly what happened. I was glad that he liked 'Pretty Paper' enough to record it over there. It's kind of amazing that the same song by the same great artist, recorded again in London 54 years later, is now having a second life." Nelson was inspired to write "Pretty Paper," when he remembered seeing a man with no legs selling paper and pencils in front of Leonard's Department Store in Fort Worth. The man, later identified by the Fort Worth Star-Telegram as Frankie Brierton of Santo, TX, was hawking his offerings to passersby, calling out "Pretty paper!," referring to holiday wrapping paper. Like all the orchestral backing for the current project, Orbison's original vocal, as noted by Willie, was recorded in London. Ever the trouper, Orbison, suffering from a 102 degree fever at the time, entered Pye Studios there and put down the vocal track for the original record that would be released in November of 1963, a mere month after Nelson had written the song. It became a holiday classic and reached #15 on the Billboard Hot 100 and #10 on the Adult Contemporary chart. Nelson recorded his own version the following year. 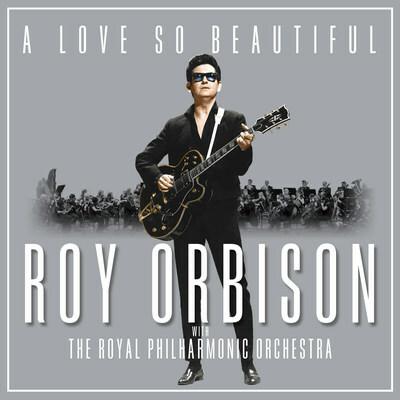 Another addition to A Love So Beautiful: Roy Orbison with The Royal Philharmonic Orchestra is an alternate version of "I Drove All Night" that features a virtual collaboration between Roy and British modern country duo Ward Thomas. Consisting of 23-year old twin sisters Catherine and Lizzy Ward Thomas, the duo has been dubbed "Britain's first country stars," and their 2016 sophomore album Cartwheels became a UK #1 hit. Their vocal performance enriches the song that was originally recorded by Orbison in 1987 and covered by Cyndi Lauper in 1989. A Love So Beautiful was produced by Don Reedman and Nick Patrick, who were also at the helm for the hugely successful albums If I Can Dream: Elvis Presley with The Royal Philharmonic Orchestra and The Wonder of You: Elvis Presley with The Royal Philharmonic Orchestra. The orchestral component was recorded at Abbey Road Studios, Studio 2, in London (a mere 1.5 miles from where Roy's "Pretty Paper" vocal track was first recorded), while Roy's sons recorded their parts in Nashville at Black River Studios, which was previously owned by their father. Also out this fall (release date: October 17; Center Street/Hachette) is the first ever estate-sanctioned Roy Orbison book, The Authorized Roy Orbison. Filled with over 300 photographs, many never before seen, gathered from across the globe and uncovered from deep within the Orbison Vault, The Authorized Roy Orbison shows Roy as a young child and follows him all the way through to the peak of his stardom and up to his tragic end. Written by Wesley, Roy Jr. and Alex Orbison - Roy's Boys - with the help of Jeff Slate, no stone has been left unturned in order to illustrate the people, places, things and events that forged their father, the man behind those famous sunglasses. The album will be highlighted as part of An Evening of Orbison at the Grammy Museum in Los Angeles on October 17, where Roy's three sons Alex, Wesley and Roy Jr. will be discussing the making of A Love So Beautiful as well as The Authorized Roy Orbison.